The Red Truck crew had another fun and busy year in 2013. Our projects included commercial jobs, jobs for past customers, and work for people relocating their homes. One of our commercial projects had us working near the airport again. 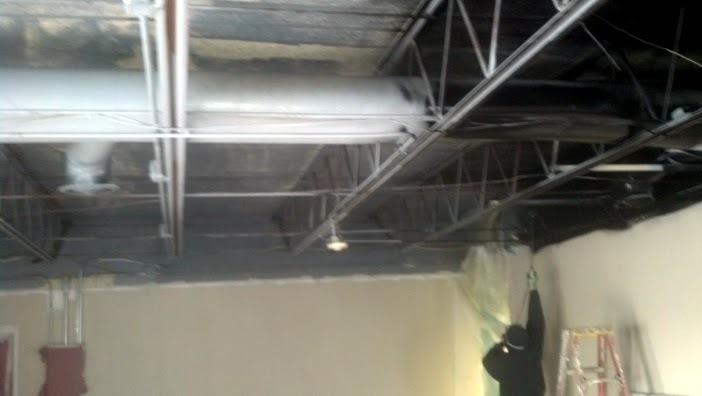 We worked in an industrial company painting an exposed ceiling. 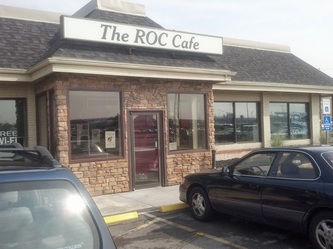 We also painted the exterior and interior of a great new cafe across from the airport - the ROC Cafe. Great sandwiches and breakfast! Another project was painting the dining room of a terrific italian restaurant on Monroe avenue - Rocco. I once worked with the chef and owner of the place back when he ran the Victor Grilling Co. The food here is simply amazing. When we weren't eating while painting - we also worked on more homes for sale, or recently purchased, with a few projects in Fairport. For most of May we worked for a couple who relocated here from the Carolinas. Fairport also had us working for friends at Bright Start Pediatrics. 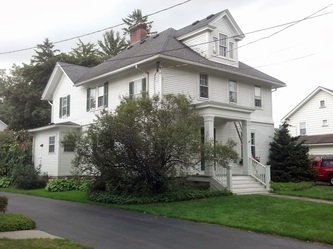 Some of our more grueling projects had us scraping and sanding very old houses, including one in the village of Fairport. We worked on the old clapboards, the old shutters, and even the dormer peaks with the use of a boom lift. These jobs are tough, but tend to be the most rewarding. Like every summer, we washed and stained quite a few decks. This year we also stained five fences, most of which we completed using our paint sprayer. We recently added a new painter to our crew. 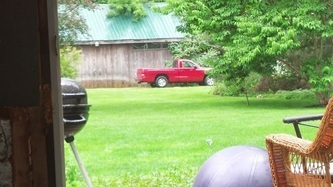 We also added a second red truck. 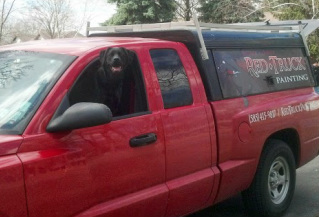 And, thanks to the folks at Coyne Design, we updated the red truck with an awesome logo, complete with my dog, Maddie! Thanks to all for keeping us busy this past year! 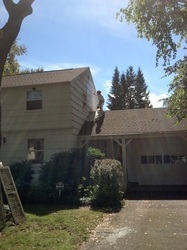 Here at Red Truck Painting, we preform a lot of Rochester wall paper removal projects. A main priority with this work is proper surface preparation after the paper is take down. When wallpaper is removed, there is often a good amount of glue residue left over. If this glue is not fully removed from the walls, it will interfere with the finish coat of paint. In cases where we cannot clean the walls fully of the glue residue, we must use a product to seal the walls before the finish is applied. Cover Stain would still be a better choice if you only want to paint only one coat of finish after the primer, because it can be tinted, while GARDZ is a clear. We always suggest two coats of paint, so for us this rarely applies. There is a learning curve to applying GARDZ (which is also true of oil primer). GARDZ is extremely watery, and has a consistency resembling milk. You must be very gentle not to squeeze the roller, or it will run very easily. Once you get the hang, though, GARDZ will spread out far and easily. Once the walls dry, give a light sanding, and they are ready for paint. The paint will go on easier, because your walls are freshly sealed. Cover Stain is made by Zinnser. Now a part of the Rustoleum company, the Zinnser brand is perhaps the best known manufacturer of primer specific coatings. This primer has been around for years, and is one of the most popular oil primers in the painting industry. We have been using this primer for years as well. Cover Stain became our go-to oil primer because it is thick, and because it blocks out stains like it is supposed to. 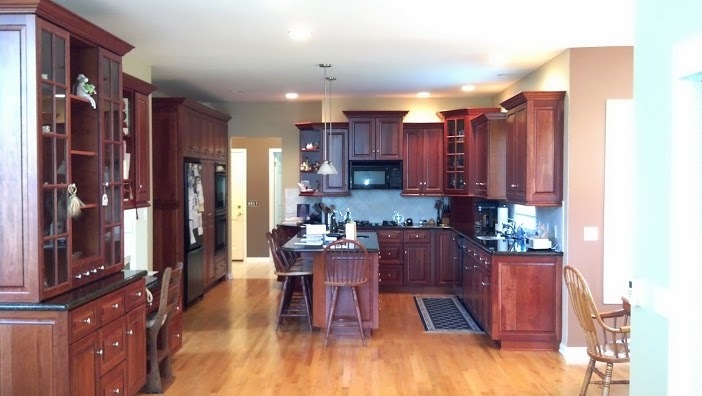 We most commonly used Cover Stain for bare wood surfaces (especially old exterior wood that is porous and/ or or prone to tannin bleed, like cedar) and for problem surfaces with staining issues. These surfaces include water stained ceilings, smoke stained ceilings, and walls from which wallpaper was removed. Cover Stain dries fast, and can be recoated in one hour, as stated on the can. We do however suggest an overnight dry with oil primers, as they can take some time to harden, and can also take time to off-gas their oil solvents. Cover Stain's main weakness is that it is very smelly, with intense oil fumes. You must use with adequate ventilation - or you will catch a nasty headache. Also, if you plan to clean your brushes be prepared to spend some time with thinner or mineral spirits. 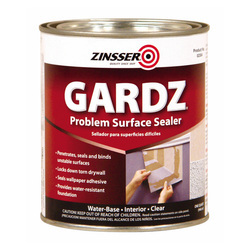 See our review of GARDZ, which offers a great, water based alternative for wallpaper removal use primer. Red Truck Painting recently completed a large painting project near the Rochester, NY Airport. 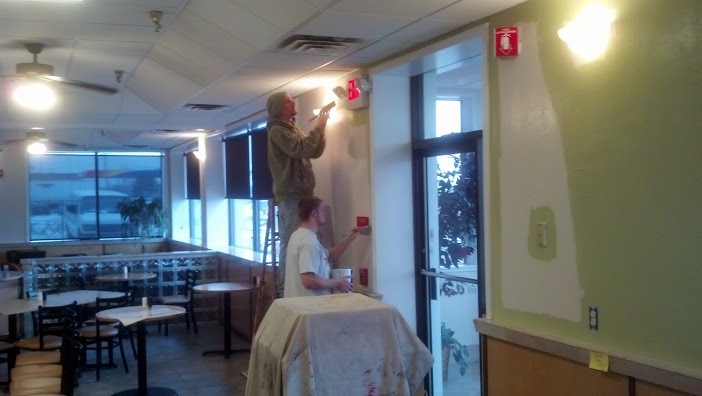 We painted for a local manufacturer, and a neighboring restaurant. At the manufacturing building, our commercial painters were asked to paint the exposed ceilings in a room that was being remodeled. This ceiling was full of supports and duct works, and there was no way we were going to get it coated with a simple brush and roller. And - they wanted it painted black. What was the solution? Dryfall paint! Dryfall paint is pretty simple to define - it dries very quickly, as it falls. So when you spray the paint, any over-spray will dry before it hits the flooring. The specific product we used was PPG Speedhide Latex Dry-Fog. This product dries after a ten foot fall. After a coat of Aqualock Latex Primer, the ceiling was ready for two coats of Dryfall. It sprayed easily, had great coverage, and cleaned up nicely. We purchased the paint from Hadlock's House of Paint. 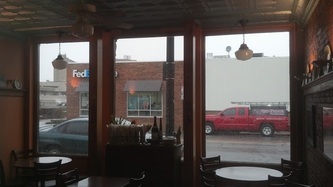 Call Red Truck Painting for your Rochester NY Commercial Painting needs! 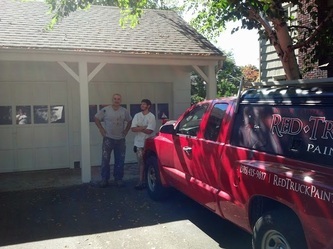 To improve our online presence Red Truck Painting has joined Thumbtack, a business networking site. This site lists local business information for different companies, along with photos and reviews. Benjamin Moore is a fantastic paint company, but not all their paint is created equally. 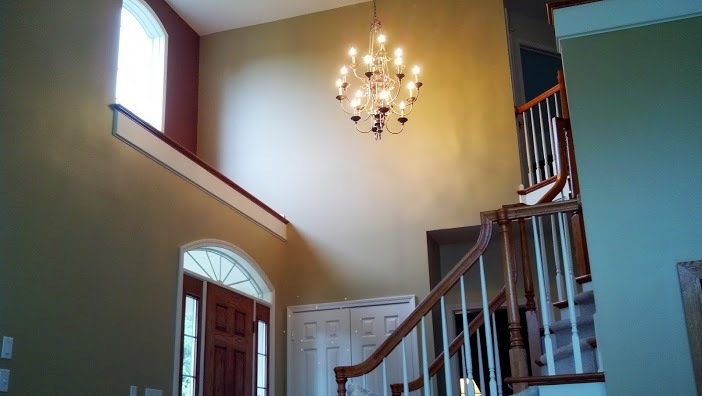 It is important to understand the differences between Benjamin Moore's various paint lines when buying paint, especially if your painting contractor is getting the paint for you. 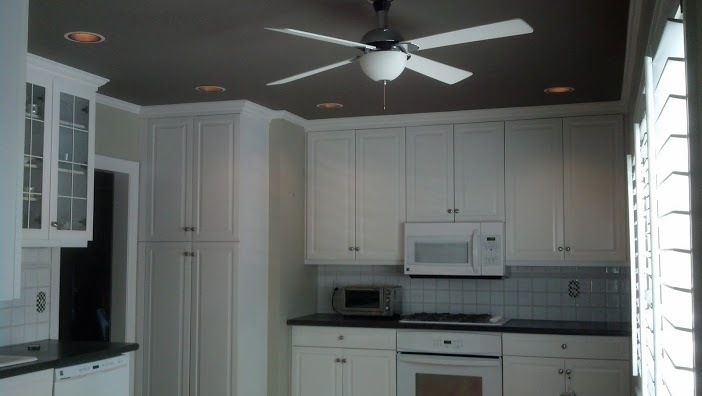 This article focuses only on interior paint lines. 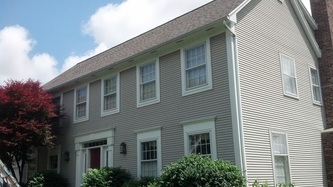 Benjamin Moore prides itself on the quality of the paint it creates. However, in order to meet the various needs of the marketplace, Benjamin Moore has multiple quality levels. After all, the needs and interests of an apartment owner or builder are very different than those of a mother with children. Benjamin Moore produces four main quality levels of its interior paints. In order of ascending quality levels, they are: Super Hide, Super Spec, Regal and Aura. The labels of all four say "Benjamin Moore" but they are also clearly labeled with the product name so with this information you'll be able to ensure you get the right product. Super Hide is the bottom of the line. 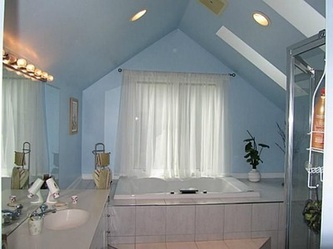 It is considered builder's grade paint and is intended only to cover well and quickly. Builder's use it because it is cheap and it touches up really well. The problem is that it needs to touch up really well. Benjamin Moore Super Hide has almost no durability and while not entirely true, I consider it "clay water". It is intended to paint new homes that are expected to be repainted with a higher quality product in a fairly short period of time. Super Hide comes in flat, eggshell and semi-gloss and can be tinted to any color. Many low-end painters will substitute Super Hide Eggshell thinking that it is just as good as the Regal products and the customer will never know. Don't let this be you. Super Spec is the next step up. Benjamin Moore Super Spec is definitely better than Super Hide. It was developed for commercial uses where cost is a factor and durability or quality isn't as important. Low-end painters will also substitute Super Spec for Regal products, too, and is also something to be wary of. Super Spec comes in flat, eggshell and semi-gloss and can be tinted to any color. 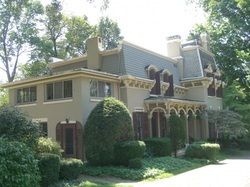 The Regal line is Benjamin Moore's premium paint line, and before Aura it was their best. 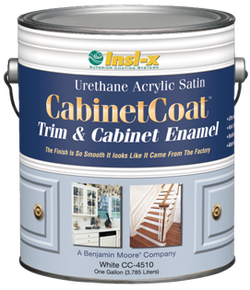 The Regal products built Benjamin Moore into the reputable paint company it is today. And these products do keep changing. Benjamin Moore has reformulated these products numberous times over the years to keep improving them. Overall, the Regal products are fantastic and compare well to any other premium paint brand on the market. Benjamin Moore Regal comes in flat, matte, eggshell, pearl, semi-gloss and high-gloss and can be tinted to any color. Benjamin Moore Matte and Benjamin Moore Eggshell are the most popular interior finishes for walls because they are washable and Benjamin Moore Semi-Gloss is the most popular finish for trim, baseboards and doors. These finishes are also referred to as Regal Flat, Aquavelvet (eggshell), Aquapearl (pearl) and Aquaglo (semi-gloss). Finally, the finest paint Benjamin Moore makes is Aura. Aura is unlike any other paint on the market. Benjamin Moore Aura paint is super-durable, does not require primer, will cover any color in no more than two coats, is low-odor and environmentally friendly and just looks richer for any color. Available in interior and exterior. With this information you will be better informed about the various paint quality options. Unless you are a builder trying to cut costs, you should use the best paint available. Relative to the overall cost of painting -- selecting your colors, tearing your home apart and living with the inconvenience, and expending the effort or expense of actually painting -- the paint itself is the least expensive part, and the difference between the best can of paint and the cheapest often only amounts to the cost of lunch or dinner one day. So given that on average you will live with the paint in your home for seven years, cutting corners on the paint quality doesn't make much sense. UPDATE: Benjamin Moore now offers a mid quality paint (falling between Super Spec and Regal) called Ben. 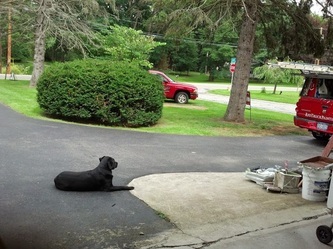 Ben is tinted with the Gennex color system, which is the waterborne colorants used in Aura. This means the colors cover better, and are more fade resistant. Another new product is called Regal Select. Regal Select is of Regal quality, but also employs the new colorants. This is available in interior and exterior. 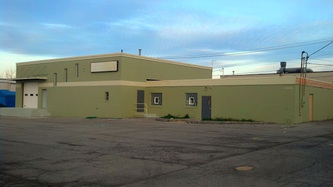 Rumor has it - this may someday replace the old Regal entirely. 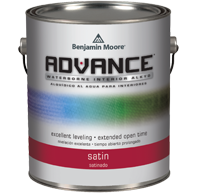 Rumor also has it - Benjamin Moore is working on a new economy line of paint to better compete with big box value paint.